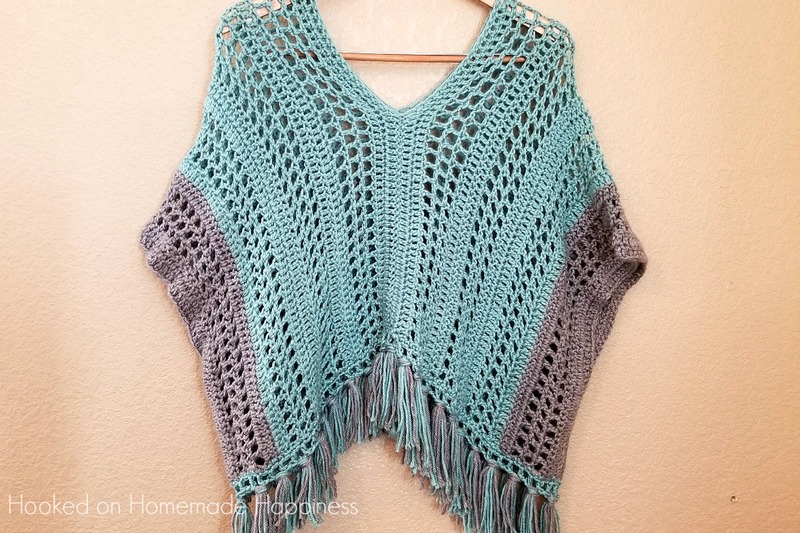 This Spring Breeze Crochet Poncho is a little shorter than your typical poncho, with an open and airy pattern. Since it’s spring, I didn’t want anything too heavy. Being in the desert, I won’t be able to wear it too many more times before it’s too hot. 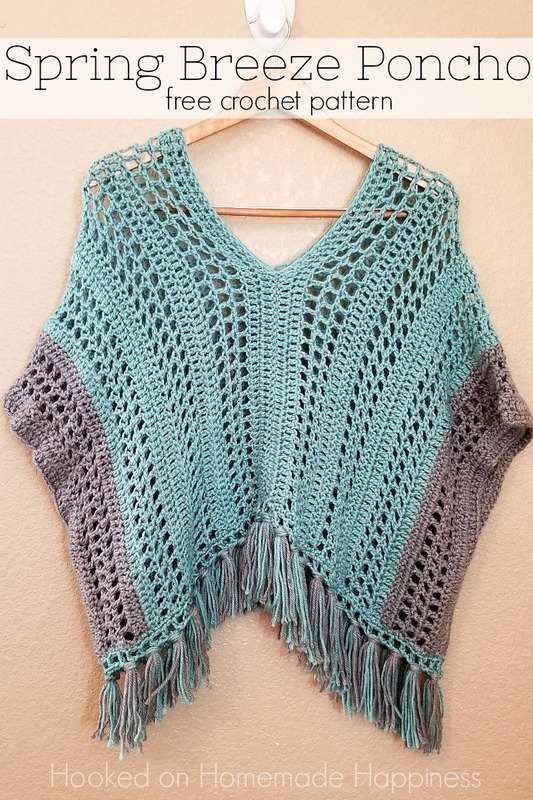 But we’re heading to northern Az this summer, so I’m excited to wear my new poncho in the cooler weather! Today we played in the park for a bit and it was comfortable and easy to play in with the littles. 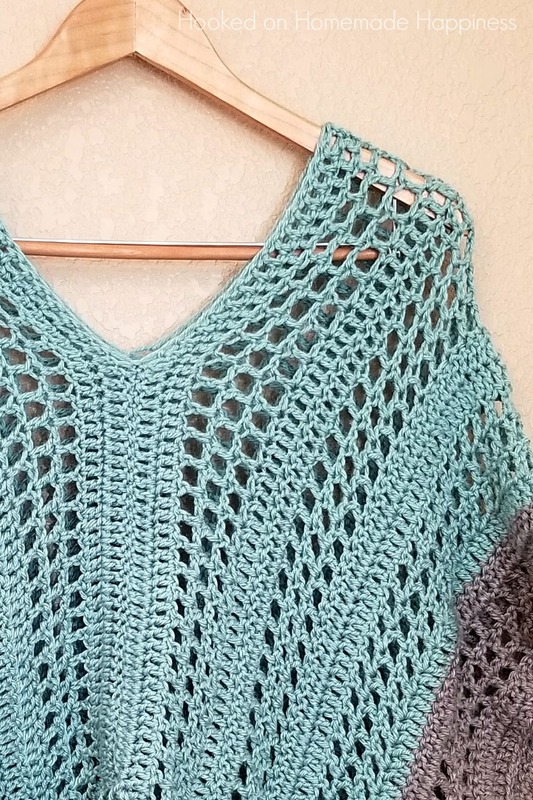 -Get the complete free pattern below or this pattern is also available as an inexpensive, clearly formatted, PDF instant download in my Etsy Shop and Ravelry Shop! For small, fasten off and weave in the ends. For medium, fasten off and weave in the ends. Fold each panel in half and lay side by side with the gray stripes on opposite ends and the fold at the top. Sew the panels together in the center with single crochet, leaving a space at the top for the neckline. Do this for the front and back. Fasten off, weave in all your ends. Turn poncho right-side out, with the single crochet seams on the inside. 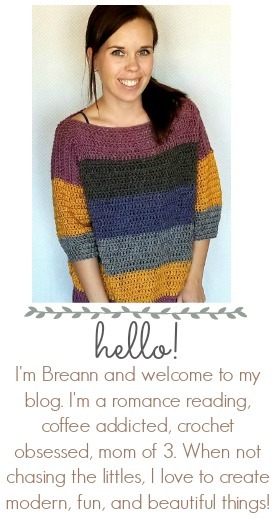 Insert your hook into a bottom corner and single crochet around the bottom evenly. Ch 4 (counts as dc + 1 ch), *skip one stitch, dc, ch 1* repeat from * to * around, join, fasten off and weave in the ends. 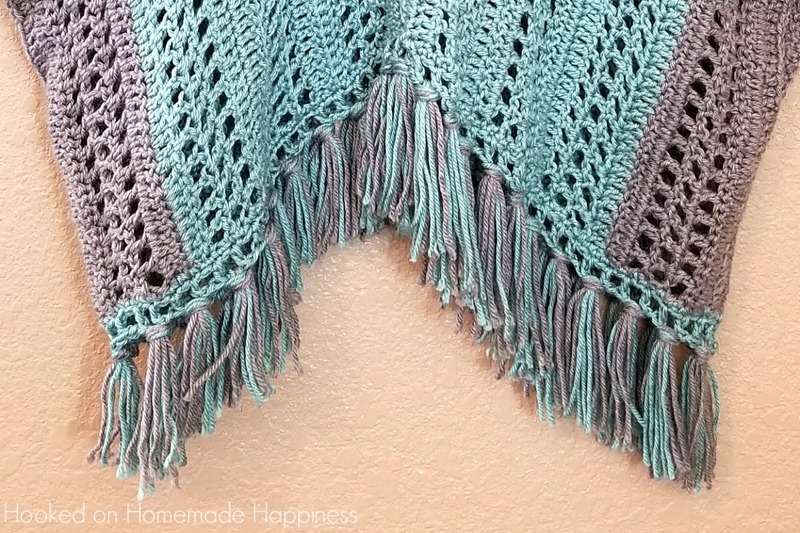 I added 6 pieces of 12 inch yarn (3 in gray and 3 in seafoam) to every other chain 1 space. Then trim the fringe to your liking. It looks so comfortable! Love the beach colors! Omg this is the cutest pancho ever I’m so going to try this ! I always get 114 dc on the first row. What am I doing wrong. I have counted my chains and am correct. I go in the fourth chain from the hook and still come up with 114dc not 113 dc. I love your poncho pattern but just cannot make it work. Hope you can help. I am an experienced crocheted. This shouldn’t be so perplexing for me. Thanks! I live the pattern and it turned out well; however, it seems to “ride up” in the back. 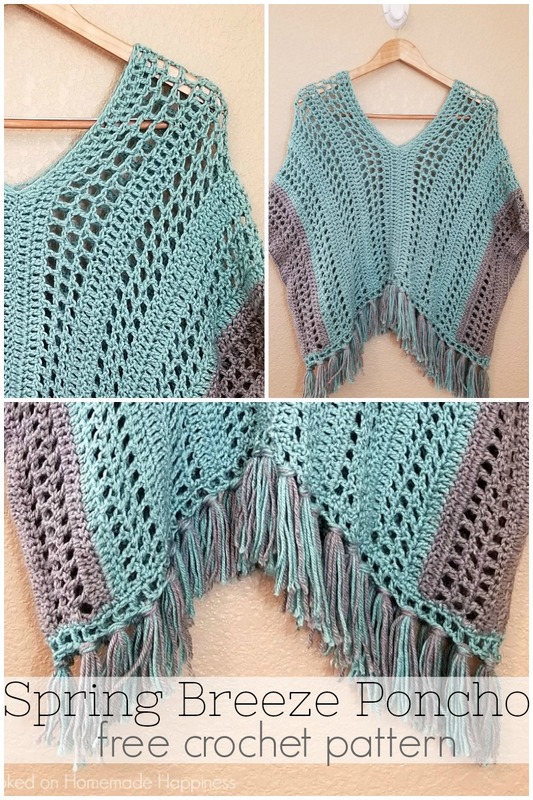 Will the fringe and blocking help? Hi! That’s kind of the nature of a poncho. You can adjust the neck by sewing it all the way to the neckline so it doesn’t move up. I hope that helps! I made an XL size and up the starting chain of 132. Each size for the width is 5inches different. However, even when it’s a chain of 132, for XL, it’s not even close to 23inches for the length. Why is this so?? Help!! It is sooooo short !! Hi! How many inches is the ch? Hi. I love this poncho. However, I have lots of fine weight yarn (1). Can I adjust it to use with this pattern? Yes, I would ch until it matches the length and then continue the repeat until it’s the width.